This necklace features a cute 1 1/4" x 3/8" key pendant encrusted with pavé round white cubic zirconias. 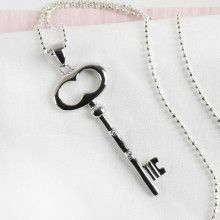 Pendant hangs from a simple silver bail on a box style chain that is 16" long, 0.75mm thick, and has a round spring clasp. Pendant measures about 1 1/4" x 3/8"